Andhra Pradesh Polytechnic Common Entrance Test Exam Pattern is Available now. Applicants can check the AP CEEP Paper Structure now. Candidates can obtain the APPOLYCET Paper Pattern 2019 on this www.polycet.co.in Website. This article is mainly taking place to provide the completed exam pattern details of the Andhra Pradesh CEEP Exam 2019. So, willing candidates have a look at the AP POLYCET Exam Paper Pattern which is provided in the following sections. We have mentioned the number of sections, each section’s number of questions, exam duration, etc. Without any knowledge about exam pattern, candidates didn’t get any idea about how to prepare for the exam. Preparation in out of syllabus subjects is a waste of time. Also, if you prepare hard and you are unable to manage the time in the exam is also gives fewer results. So, applicants beware of the AP POLYCET Duration and sections. Candidates should prepare hard only in the sections included in the AP CEEP 2019. Applicants can also focus on the time management to do best in the Andhra Pradesh POLYCET Exam. Thus they must be very confused about preparation which leads less score. To overcome this, candidates must refer the provided APCEEP Exam Pattern 2019. Andhra Pradesh State Board of Technical Education has announced the AP CEEP Notification 2019 recently. So, candidates who are interested in continuing the further studies in diploma streams within Andhra Pradesh can check the details. Interested candidates must submit AP POLYCET Online Applications before the last date. No, applications will be accepted after the last date. Also, there will be some server issues at the closing dates. It is better to complete the Andhra Pradesh CEEP applications in early days. 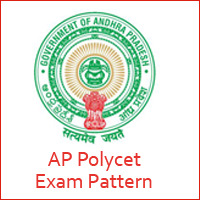 Go below for AP POLYCET Exam Pattern 2019 details. Andhra Pradesh Common Entrance Test for Polytechnic conducts in Paper-Pen Mode. APCEEP Exam has three sections such are A, B, C.
Subjects included in Andhra Pradesh POLYCET Exam are Mathematics, Physics, Chemistry. Mathematics Section – 60 questions. Physics Section – 30 questions. Chemistry Section – 30 questions. My Nephew has Documents verification problem with regards to Fee reimbursement .His father is not in Ration card. I am requesting you to help us is there any alternative for this issue.